(Newser) – The destruction of Syria's chemical weapons continues to hit delays—but a secret effort to rid Libya of chemical weapons has been a success, the New York Times reports. The US and Libya have been destroying what was left of Moammar Gadhafi's stockpile, including hundreds of weapons containing a mustard agent. The three-month project, which wiped out two tons of arms using what the Times calls a "giant, high-tech oven," ended last week. "It’s a big breakthrough," says an expert, noting that the process—a basis for the much larger effort in Syria—"was very difficult because of weather, geography, and because it's a dangerous area with warring tribes, increasing the risks of theft and diversion." Start of the civil war 2011? So 8 years after the US gained control over Iraq in the 2003 Attack on Iraq. So a US controlled country had two tons of chemical weapons for 8 years. 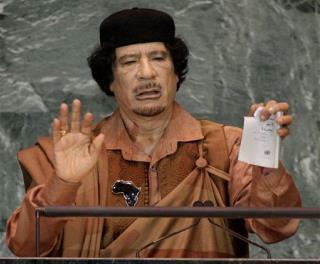 "In 2004, Gadhafi had provided some 24.7 metric tons of chemical weapons to the West for destruction" So this negotiated turn over of WMD's started in 2004. hmmmm I wonder who was president then ? I wonder WHERE he got the chemical weapons? ?